Leadership Berks is a program dedicated to developing, supporting, and connecting community leaders in Berks County. 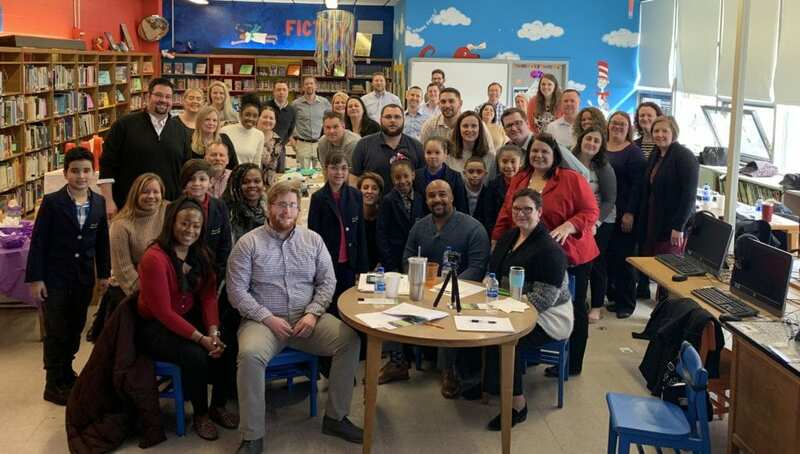 Leadership Berks Class of 2019 at Lauer’s Park Elementary School in Reading. The mission of Leadership Berks is to serve as the premier source for developing, educating, and connecting Individual, organizational, and community leaders for life starting in Reading and Berks County, PA. Leadership Berks is signature program of the GRCA. Leadership Berks was founded in 1985 by the Greater Reading Chamber of Commerce, the United Labor Council, the United Way of Berks County, and the Junior League of Reading, PA. Our programs leverage the power of leadership, influence, relationships, education, and service to deliver unique professional and leadership development learning experiences that build stronger individuals, organizations, and communities. In 2018, the program moved from Alvernia University to the GRCA. Learn more about our history and get the facts on just how impactful this program is to students, businesses, nonprofits, and the community at large. Check out our Program to see how Leadership Berks shapes leaders. If you’d like to be part of our next class, apply now! Learn more about the Core Program, which is designed to identify emerging and current leaders; train them about good governance practices; provide issues-based community orientation; and engage them as community leaders on local nonprofit boards and committees. To learn more about Leadership Berks and its benefits, please watch our video. The Leadership Berks curriculum is designed with the adult learner in mind with a minimum of 20 but not more than 35 students in each cohort. Applications are accepted between April 15th and September 1st with the program cycle beginning annually in mid-September and commencing in mid-June. A full schedule of program sessions and events is included in the application. The application deadline for each program cycle is August 30th. Upon acceptance, all application data and key essay themes are summarized and provided to Leadership Berks faculty to allow them to better understand the student cohort, to customize instruction as needed, and to address specific perceptions or misconceptions about the community’s assets and challenges. The curriculum allows students to interact closely with faculty, area leaders and content experts, community organizations, and peers from a broad cross-section of professions, and the community at large. Tuition rates are included in the application. Limited scholarships may be available. Special conditions apply. For more information about Leadership Berks visit us online or on Facebook. Your first step is applying via our simple online application. Leadership Berks provides great benefits to local nonprofit and community organizations. Learn more. Many Berks area community leaders regularly take time to present lectures and projects to our Leadership Berks classes. Learn more. Many local employers sponsor participants in the programs year after year. Learn more.